The error fix is non-breaking, but less certain about the IUO warnings. Okay, the second issue I've found was an issue with Nimbles internal tests. When building Nimble via Carthage in a project and using it for tests, everything is working now as expected, so I fixed the above issue and sent a Pull Request onto the branch of this PR here. @sharplet Would you mind have a look and merge, please? Discussing details of @Dschee's stringify fix over here: #532 (comment). It would be nice to also have this on CI, but that will probably take a little while. Shouldn't stop us from merging this I would hope. @Quick/core where do we stand on the definition of breaking changes? This should be a source-compatible change, in which case it seems fine to include this in a patch release. Not binary compatible though. Yeah, that's the "second issue with Nimbles internal tests" I was talking about earlier. 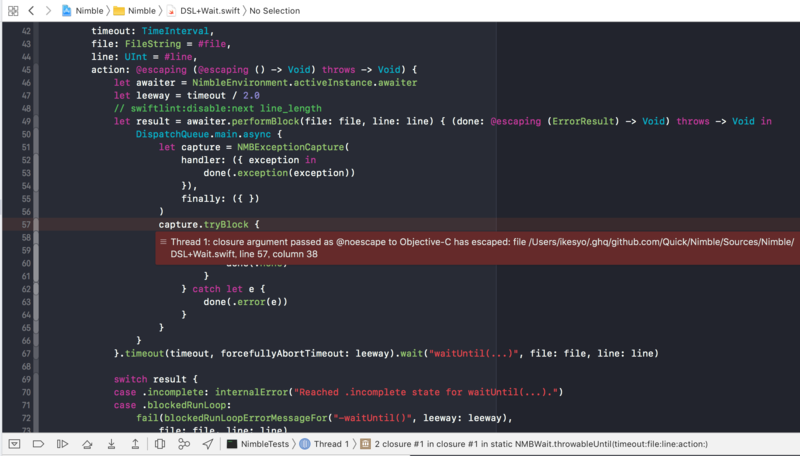 But please note that this issue only arises when running tests on Xcode 10 beta, tests are passing in Xcode 9.4 which is what we should be worried about most right now. 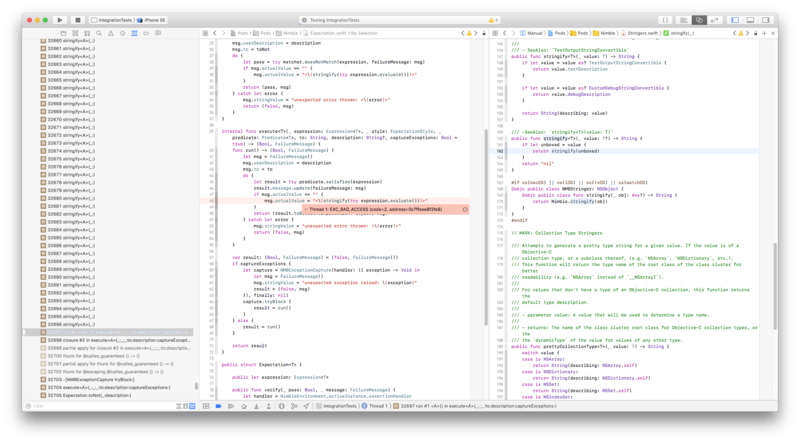 It's possible that the failing test in Xcode 10 is due to bugs in the beta software. And even if this was not the case, this MR is still better merged cause it works for most of us and therefore is better than a version that doesn't build at all in Xcode 10. Is anyone at WWDC that could take this crash to the a Swift lab? In any case, I'm going to go ahead and merge! @ikesyo Interested in tagging 7.1.2? @sharplet Okay, I will backport this to 7.x-branch and release 7.1.2. Lol I just got the same answer in the labs. @ikesyo did you file a radar I can dupe? Radar: 40857699 "Swift runtime crash when closure passed as @NoEscape is mistakenly identified as having escaped (Nimble)"